Bold and fearless, Nina Markova always dreamed of flying. When the Nazis attack the Soviet Union, she risks everything to join the legendary Night Witches, an all-female night bomber regiment wreaking havoc on the invading Germans. 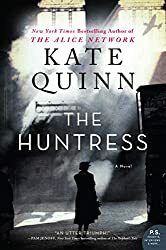 When she is stranded behind enemy lines, Nina becomes the prey of a lethal Nazi murderess known as the Huntress, and only Nina’s bravery and cunning will keep her alive. Transformed by the horrors he witnessed from Omaha Beach to the Nuremberg Trials, British war correspondent Ian Graham has become a Nazi hunter. Yet one target eludes him: a vicious predator known as the Huntress. To find her, the fierce, disciplined investigator joins forces with the only witness to escape the Huntress alive: the brazen, cocksure Nina. But a shared secret could derail their mission unless Ian and Nina force themselves to confront it. Growing up in post-war Boston, seventeen-year-old Jordan McBride is determined to become a photographer. When her long-widowed father unexpectedly comes homes with a new fiancee, Jordan is thrilled. But there is something disconcerting about the soft-spoken German widow. Certain that danger is lurking, Jordan begins to delve into her new stepmother’s past—only to discover that there are mysteries buried deep in her family… secrets that may threaten all Jordan holds dear.